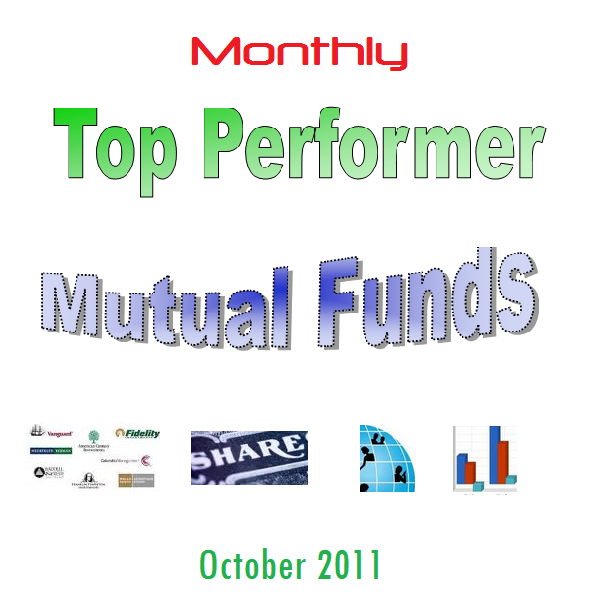 This article will provide list of Monthly Top Performer Mutual Funds of October 2011. The top performing funds are: BlackRock Energy & Resources Inv A, Schneider Small Cap Value, Pacific Advisors Small Cap Value A, and more. The market performance for the month of October has been outstanding. Most indices have produced double digits return whether it is international indices (DAX, Nikkei, FTSE 100, etc) or domestic indices (S&P 500, Nasdaq, NYSE, Dow Jones Industrial, Russell 2000, etc). On my previous article, I have provided the top performer mutual funds (leveraged version). This top performer list will only provide a list for non-leveraged mutual funds. As we know, market turned higher for this past 1 month. 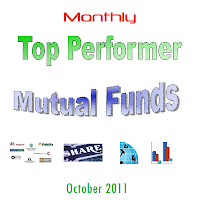 I will provide the monthly top performer mutual funds list. This fund list includes ProFunds Oil Equipment Service & Distribution Inv, Direxion Monthly Commodity Bull 2X, ProFunds UltraLatin America Inv, and more. The list does include leverage mutual funds. Please be advised, these leveraged mutual funds may be too risky for you. If you are interested in non-leveraged mutual fund list, please check my next article. More fund’s review can be found below. The market performance for this past October 2011 has been epic to say the least. Individual stocks gained at least 10% or more. Some stocks may even record between 30% and 50% returns for 1 month. 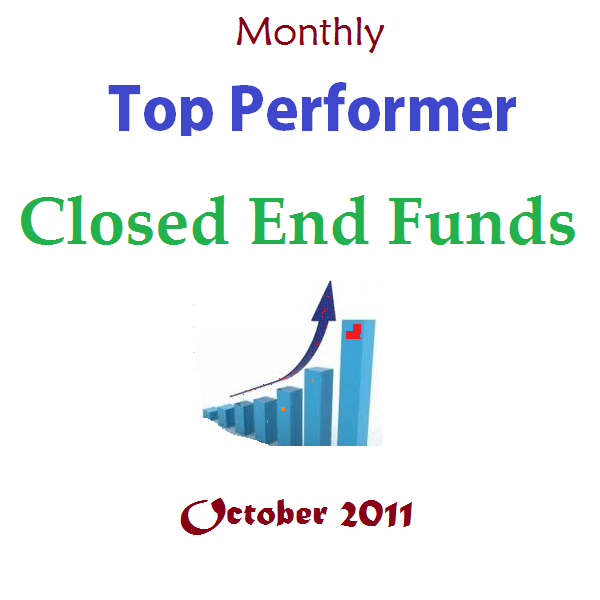 This article will look into the top performing closed end funds for October 2011. 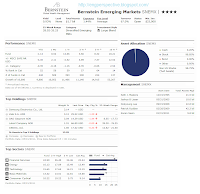 The top performers include Equus Total Return (EQS) fund, Petroleum & Resources (PEO) fund, Korea Fund (KF) fund, and more. 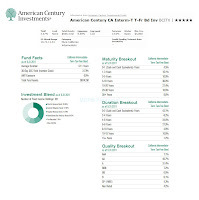 American Funds Growth Fund of America fund (AGTHX) is a popular domestic stock mutual fund. The fund invests in common stocks of U.S. companies with high growth. The following large growth stock fund is among the largest mutual funds in US with assets of $122.6 Billion. The Growth Fund of America is also popular among investor hence it offers in retirement account or regular brokerage account. Details about the fund’s review can be found below. As part of American Funds fund family, the Growth Fund of America A fund objective is to deliver capital growth by investing in common stocks of best growth companies. The fund typically invest >65% of its assets in common stocks. It may also invest minority of its assets (<25%) in foreign stocks (outside the United States). This American Funds fund can invest in preferred stocks, convertibles, US Government securities, bonds, and cash equivalent. It also may invest <10% of assets in non-investment grade bonds or junk bonds. Charlie Fernandez, the comanager on the Fairholme mutual funds, has left the firm recently. 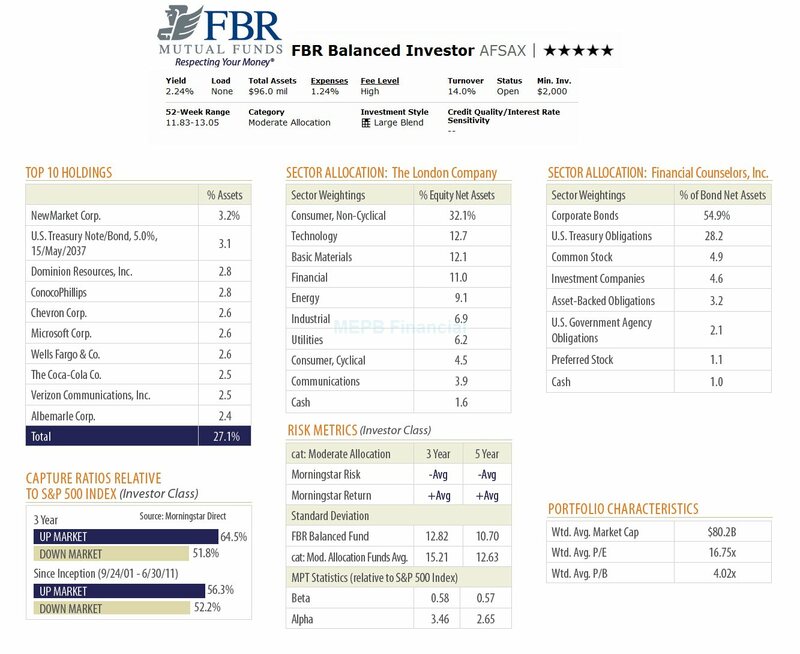 Fernandez was the comanager of Fairholme (FAIRX) fund, Fairholme Focused Income (FOCIX) fund, and Fairholme Allocation (FAAFX) fund. This left these funds with the only manager, Bruce Berkowitz. Berkowitz is the firm’s founder. He is among one of the well-known fund’s manager. His recently bet on financial services has made the funds to underperform. Based on latest fund’s performance, the fund’s has loss 26% of its assets. There are no details about the reason of his departure from the Fairholme firm. Fernandez joined the Fairholme fund in 2008. The following fund is about Fidelity Concentrated Canadian Equity Private Pool B fund. This Fidelity fund has gaining popularity for Canadian. Additional fund's review can be found below. The Fidelity Concentrated Canadian Equity Private Pool-B fund objective is to provide excess return relative to the S&P/TSX Composite Index over a full market cycle. This Fidelity fund invests in a portfolio of Canadian equities. The portfolio is constructed with the goal of ensuring that active return is generated through stock selection. The inception date of this investment fund is November 26, 2008 (Series B). Besides this series, there are other series of this Fidelity Canadian Concentrated Equity Private Pool fund, such as Series S5, Series S8, Series F, Series F5, Series F8, Series I, Series I5 and Series I8. Kindly note that there is another quite similar fund which is Fidelity Canadian Equity Private Pool that is available in the same range of series. This fund has a small yield of 0.35%. This dividend yield is paid annually. The annual expense ratio is 2.03%. The fund also has a front end sales load. The total fund assets are $28 Million. This fund is eligible for Canadian RRSP. 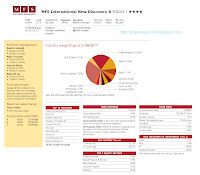 MFS International New Discovery is one of the best small/mid cap international stock mutual funds. Similar to small US Stock fund, this foreign small/mid growth stock fund is volatile than any typical foreign large cap fund. Details about the fund review can be found below. 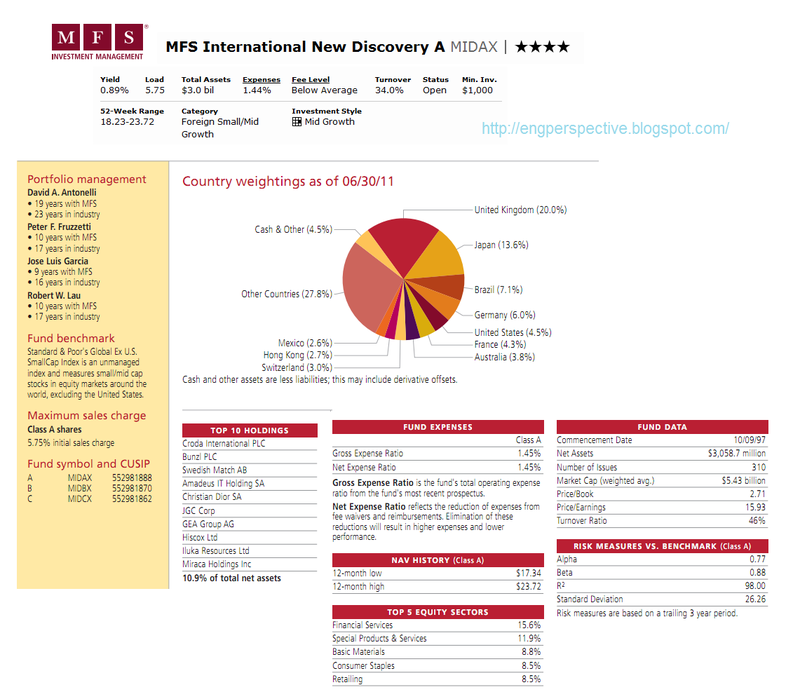 The MFS International New Discovery fund objective is to provide capital appreciation. The fund generally invests in foreign equity securities, including emerging-market equity securities. It generally focuses on companies with small- to medium-capitalizations although it may invest in companies of any size. The fund also invests in derivatives. It may also enter into short sales for the fund. The lead fund's manager of this MFS fund is David Antonelli. He has managed this fund since its inception in October 1997. Investor can invest in this fund by opening a brokerage account with $1,000 minimum initial investment and $250 for IRA account. The 12b1 of this fund is 0.25% and the front-end sales load fee is 5.75%. The expense ratio of this CCAFX fund is 1.44% per year. This fund is in the Foreign Small/ Mid Growth category. During the growth period, US small cap stock funds can outperformed their peer, US large cap stock fund. These equity funds have higher return over the long term. One of this best US Small Cap stock fund is Wells Fargo Advantage Small Cap Value Investor fund. The fund reviews can be found below. The Wells Fargo Advantage Small Cap Value fund investment seeks long-term capital appreciation. The fund invests >80% of net assets in equity securities of small-capitalization companies, which are defined as companies with market capitalizations within the range of the Russell 2500 Index. It can invest up to 30% of total assets in equity securities of foreign issuers through ADRs and similar investments. Furthermore, the fund can use futures, options, repurchase or reverse repurchase agreements or swap agreements, as well as other derivatives, to manage risk or to enhance return. This Wells Fargo fund’s manager is I. Charles Rinaldi. He has been managing this Wells Fargo Advantage mutual fund since its inception in December 1997. The expense ratio of this small blend stock fund is 1.35% annualy. This fund has no 12b1 fee and no front-end sales load fee. This fund has net assets of $4.11 billion. Mutual Funds or Investment funds can be used to provide asset diversification. To diversify your portfolio, you will need to invest in best rated fund. As we know, the Canadian Equity funds have outperformed its peer, the US Equity funds. 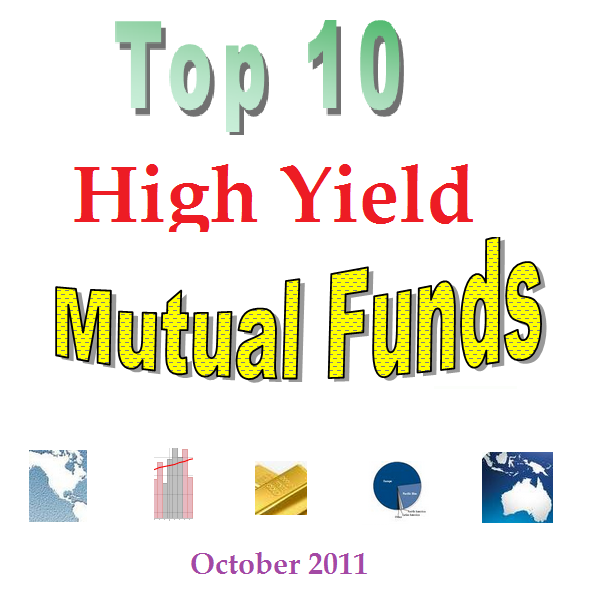 The following article is about Top 10 Best Rated Canadian Equity Mutual Funds of 2011. These best rated funds include Bissett Canadian Equity Class A, RBC O'Shaughnessy All Canadian Equity, Manulife Canadian Investment Class, and more. 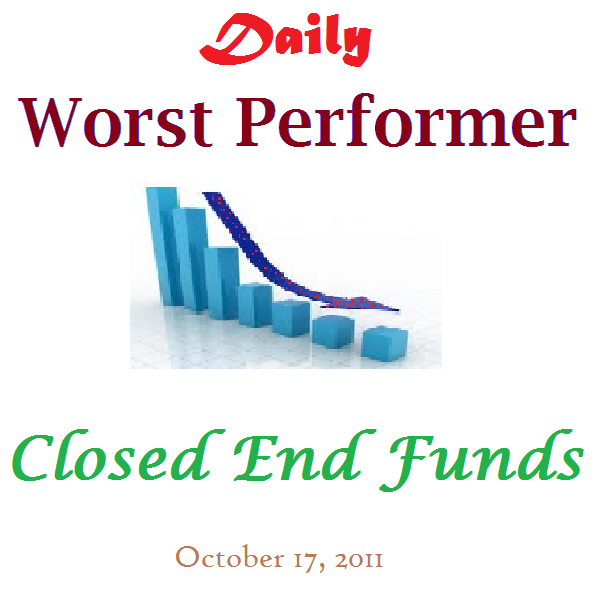 The following is the top performer CEFs for week 42 of 2011. The top performing funds include Engex Inc (EGX), PIMCO Gl StksPLUS & Inc (PGP), Kayne Anderson Enrgy TR (KYE), etc. This week only observed with single digit gain for most closed end funds. We have a diverse selection of classes for this week such as core fund, option strategy fund, high yield bond fund, emerging markets stock fund, energy sector equity fund, etc. As part of Best Moderate Allocation Balanced Fund, FBR Balanced Fund has consistently outperformed many of its peer funds. This article will provide the fund’s review and details such as fund’s objective, yield, top holdings, net assets, and more. Details about the fund can be found below. The FBR Balanced Fund’s objective is to provide long-term capital growth and current income. This moderate allocation mutual fund invests in a blend of domestic common stocks, preferred stocks, convertible bonds, high quality domestic corporate, agency, and government bonds. It may also invest in mortgage-backed securities, asset-backed securities and Yankee bonds. The fund may invest < 10% of assets in high yield bonds or junk bonds. 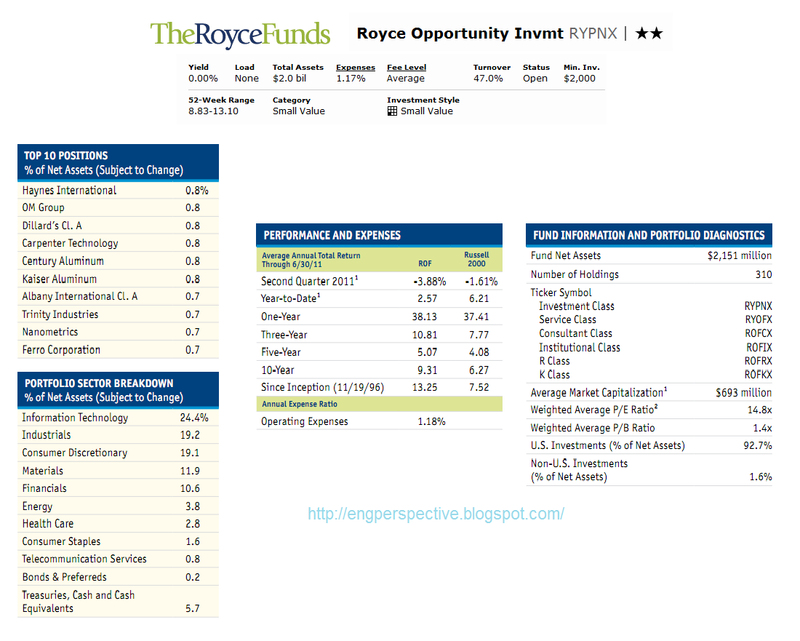 According to the latest Forbes Magazine, Royce Opportunity Investment fund is one of the best mutual funds of 2011. The following is the details about the fund review including fund's manager, fund's objective, top 10 holdings, and more. 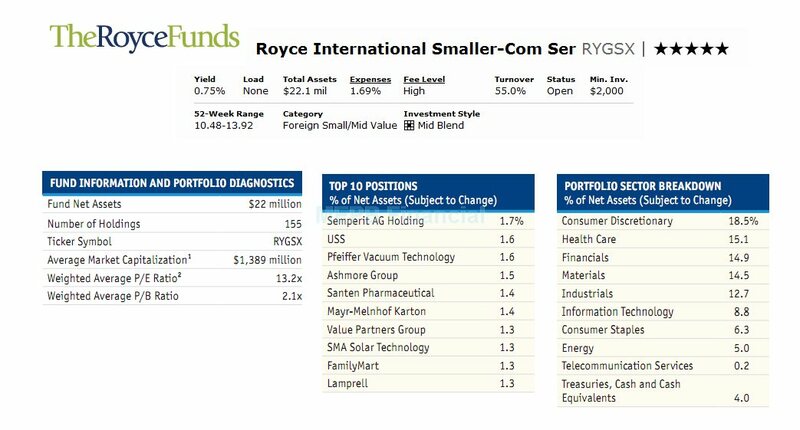 This Royce fund is part of small value US stock fund. 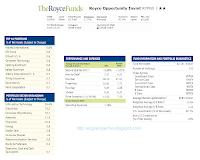 The Royce Opportunity fund objective is to seek long-term growth of capital. The fund invests mainly in the equity securities of small- and micro-cap companies, those with market capitalizations <$2.5 billion. Although the fund typically focuses on the securities of companies with market capitalizations up to $2.5 billion, it may, in certain market environments, invest an equal or greater percentage of its assets in securities of larger-cap companies and may invest <10% of its assets in foreign stocks. This investment fund is categorized in Small Value equity fund. Boniface Zaino has managed this Royce fund since April 1998. The fund has $2.15 billion net assets. The annual expense ratio is 1.17%. This fund has no 12b1 fee and no sales load fee. The fund has had 11 years in positive performance since its inception 14 years ago. This fund has returned 20.68% over the past year and 9.08% over the past ten years. Domestic stock mutual funds can be categorized into three main categories: large cap domestic stock fund, mid cap domestic funds, and small cap domestic funds. One of this best mid cap domestic stock funds is Scout Mid Cap. I have provided this investment fund review and details below. The Scout Mid Cap fund is seeking long-term capital growth. This Scout fund typically invests >80% of net assets in mid-cap equity securities. According to the fund’s prospectus, this fund will invest in mid cap companies with market capitalizations between $1.5 billion and $17 billion. The fund invests primarily in securities of U.S. companies, but may invest some of the portfolio in foreign companies (<20% of assets), American Depositary Receipts ("ADRs") or Global Depositary Receipts ("GDRs"). 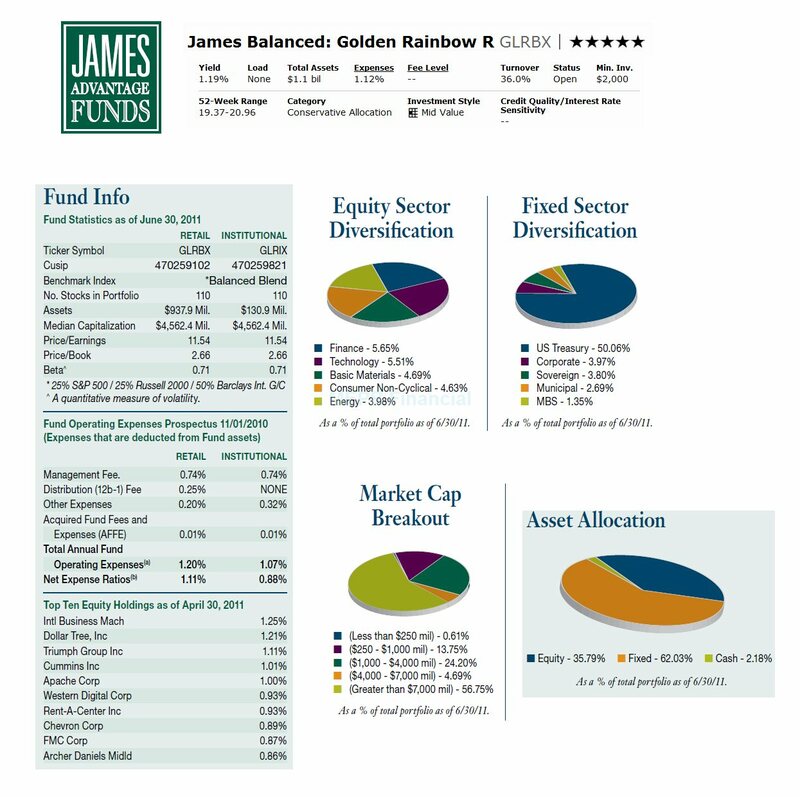 As part of conservative allocation balanced fund, James Balanced Global Rainbow R is also considered among the best balanced fund. The following article will provide the fund’s review and details such as fund’s yield, top 10 holdings, objective, and more. 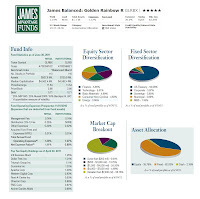 The James Balanced: Golden Rainbow fund’s objective is to achieve total return through a combination of growth and income and preservation of capital in declining markets. This James Advantage fund invests mainly in undervalued foreign & domestic equity securities and in fixed income securities. It typically holds both equity securities and fixed income securities, with > 25% of assets in equity securities (stocks) and >25% of assets in fixed income securities (bonds). Some or all of equity portion of the fund may be invested in small and micro capitalization companies. Looking into the worst performer funds may provide additional insight for investor. 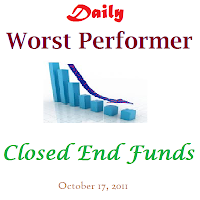 The worst performer closed end funds for October 17th, 2011 are Turkish Investment Fund, Dreyfus Strategy Municipal Bond, Royce Micro-Cap Trust, and more. 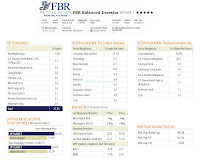 These funds are rated based on its performance on October 17th, 2011 (Monday). Closed End Funds are the opposite of mutual funds or open end funds. 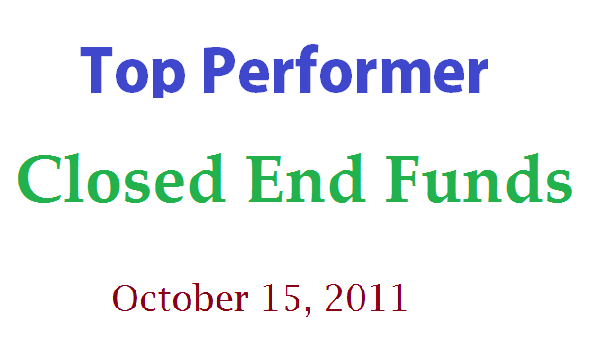 Closed End Funds are traded like stocks or ETFs on stock exchanges (NYSE, Nasdaq, AMEX). They can be traded during market day at any time. Their market price can be traded either premium or discount to their NAV. Some of these funds may use leverage to enhance the fund’s performance or return. 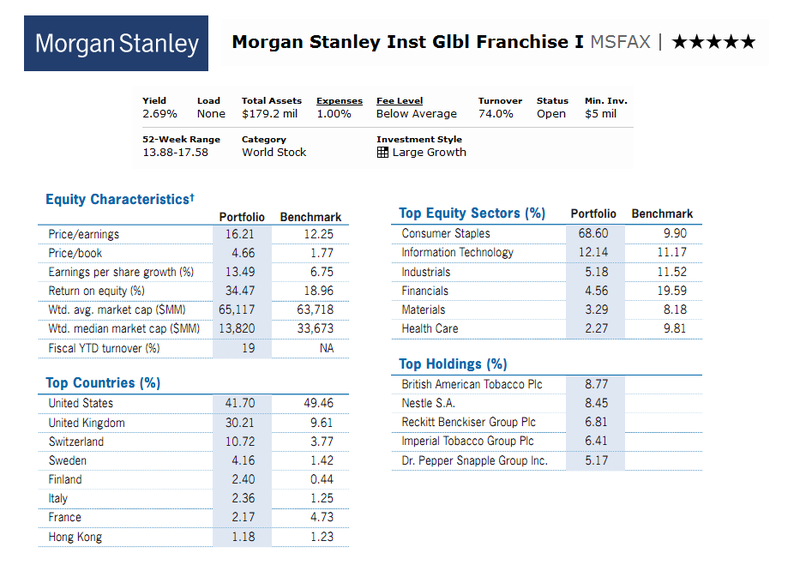 This article provides mutual fund review of Morgan Stanley Institutional Global Franchise fund. More details about the fund performance, fund details, yield, and more. As part of world stock fund, this Morgan Stanley fund has been one of the best world stock fund. The Morgan Stanley Institutional Global Franchise investment fund seeks to provide long-term capital appreciation. This Morgan Stanley fund invests mainly in world equity securities of companies that have resilient business franchises and growth potential. It typically invests in securities of issuers from >3 different countries, which may include the United States. The fund focuses its holdings in a relatively small number of companies and can invest <25% of assets in a single issuer. It can also invest in the equity securities of any size company and use derivative instruments. The following article is about Calamos Growth & Income A Fund. As part of best aggressive allocation balanced mutual fund, I’ll provide details about the fund’s review and details including fund’s yield, top holding, sales load and more. Balanced mutual fund is also known as hybrid fund. This fund usually has assets in bonds and stocks. The portfolio diversification will depend on the fund’s objective. There are 5 types of balanced mutual funds such as Aggressive Allocation, Moderate Allocation, Conservative Allocation, World Allocation, and Retirement Income. The Calamos Growth & Income fund seeks high long-term total return including capital appreciation and current income. This Calamos fund invests mostly in a diversified portfolio of convertible, equity and fixed-income securities of U.S. companies without regard to market capitalization. The average term to maturity of the convertible and fixed-income securities purchased by the Fund will typically range from two to ten years. The following is the top performer CEFs for week 41 of 2011. The top performing funds include Alpine Global Premier Properties, Foxby Corporation, ING International High Dividend Equity Income and more. These past 2 weeks have been great for investor. The market provided double digit returns. 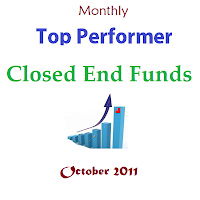 Closed End Funds were among the top performing funds. The following funds have returned 10% or higher for the past week. Majority of these outperformers are global equity funds, growth funds, real estate sector funds, etc. Muni bond fund is another popular investment fund among investor especially a high income earner and retiree. One of the best feature of this fund is it provides regular income exempt from federal tax rate to investor. 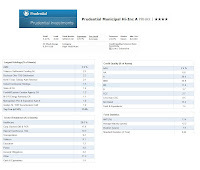 One of this best muni bond funds review is Prudential Municipal High-Income fund. Details review is described below. 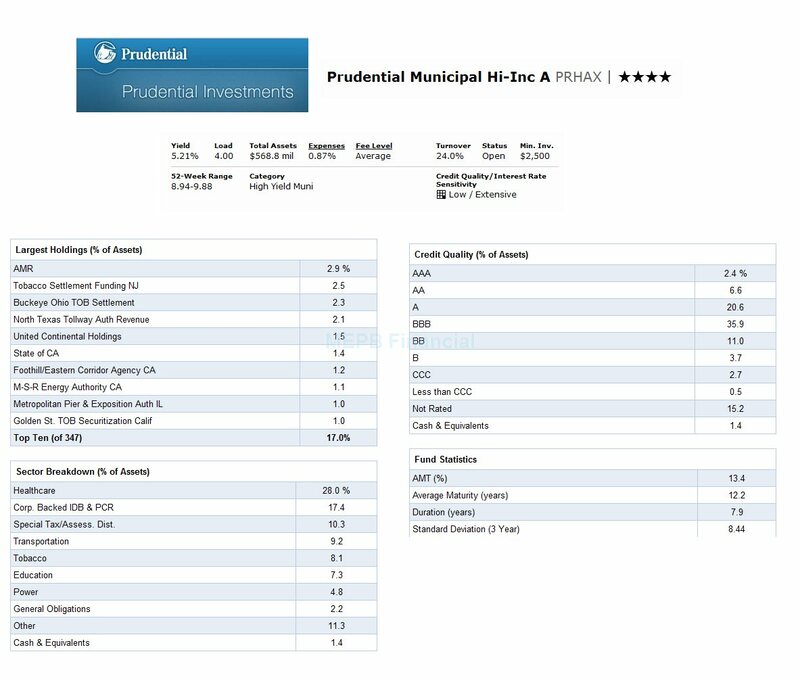 The Prudential Municipal High-Income fund’s objective is to achieve the maximum amount of income that is not subjected to federal income taxes. This Prudential fund invests >80% of its investable assets in municipal bonds, which are fixed-income securities issued by states and municipalities. The income provided by this fund is free from regular federal income tax. The investments may include certain municipal bonds of which the interest is subject to the federal alternative minimum tax (AMT). The fund's management normally invests in municipal bonds that it believes may provide above-average yields. US Stock funds should be your main pillar in your investment portfolio. There is variety of US stock fund such as large growth, large value, large blend, small value, mid blend, etc. Investor need to focus on large cap fund for their main portfolio. One of this best US Stock fund is ING Corporate Leaders Trust Series B. Details about the fund review is described below. 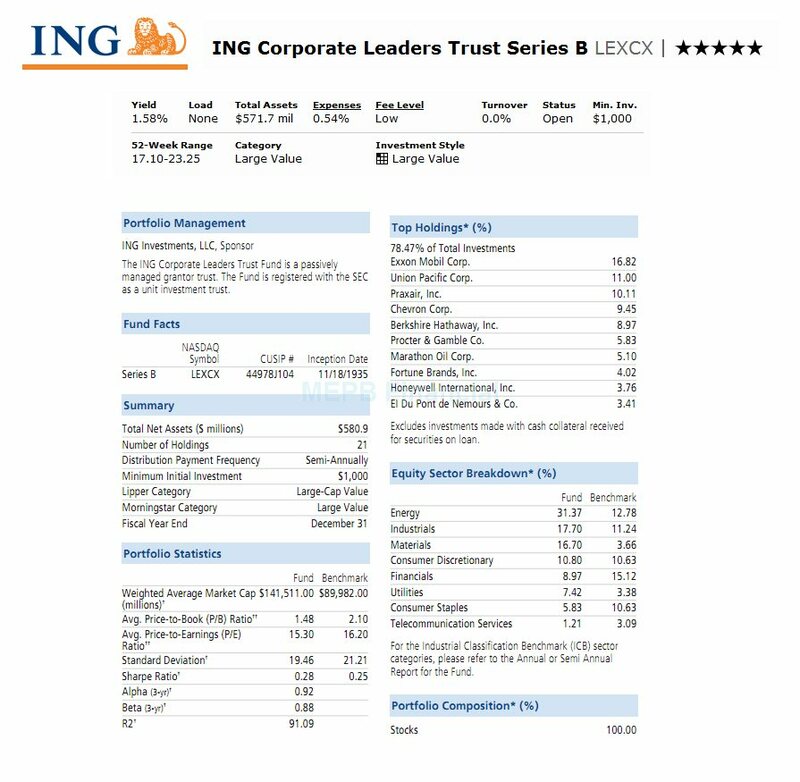 The ING Corporate Leaders Trust fund seeks long-term capital growth and income. This ING fund mostly invests in an equal number of shares of common stock of a fixed list of American blue chip corporations. Currently the Trust is invested in 21 of such corporations. Domestic stock mutual funds are majority part of investor portfolio. 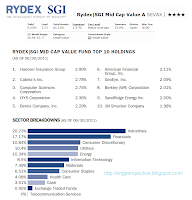 One of this best domestic stock fund is Rydex / SGI Mid Cap Value A fund. This best fund invests mainly in small cap stocks. Details about the fund review can be found below. 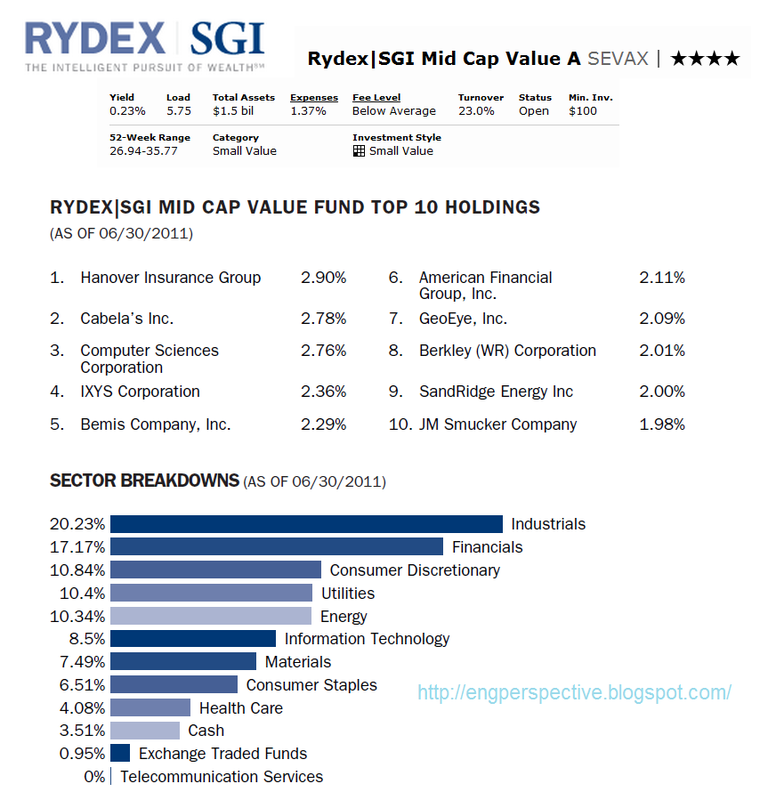 The Rydex / SGI Mid Cap Value fund is seeking long-term growth of capital. The fund generally invests >80% of net assets in equity securities of companies that, when purchased, have market capitalizations that are similar to those of companies in the Russell 2500 Value Index. This Rydex|SGI fund may invest a portion of its assets in options and futures contracts. This SEVAX fund has $1.53 billion net assets. This fund is in the Small Value category. The annual expense ratio of this fund is 1.37%. The fund dividend yield is 0.22%. This fund does have 0.25% management fee and 5.75% front-end sales load fee. This fund is currently managed by James P. Schier. He has been with this fund since its inception in May 1997. The benchmark of this fund is Russell 2500 Value Index. The following is the Top Performer CEFs for week 40 of 2011. The top performing funds include Aberdeen Latin America, Malaysia Fund, Latin American Discovery, and more. Unlike Mutual Funds, Closed End Funds (CEFs) are traded like stock or exchange traded funds (ETFs). These CEFs can be attractive for investor who seeks value fund and regular income. Some of these Closed End Funds may provide very high income and its market value maybe lower than its Net Asset Value (NAV). Detail funds’ performance can be found in the following table. One of the largest municipal bond funds is California Municipal bond fund. One of this best California municipal bond funds is listed below. Muni bond fund is attractive hence its distribution rate or yield is not subjected to federal tax rates. For single state municipal bond fund such as California muni bond fund, the dividend is even exempt from California state tax. This fund may also use as a way to diversify your asset portfolio. The Northern California Tax-Exempt Fund is seeking to provide high current income exempt from federal income tax and California personal income tax. This Muni bond fund generally invests majority of the fund's net assets (>80%) in debt instruments that pay interest which is exempt from regular federal income tax especially in California municipal instruments. This best bond fund may also invest to a limited extent in obligations that are rated below investment-grade or junk bonds. The average weighted maturity typically ranges between 10 and 30 years. Mid Cap domestic stock mutual fund is typically outperformed large cap stock fund. 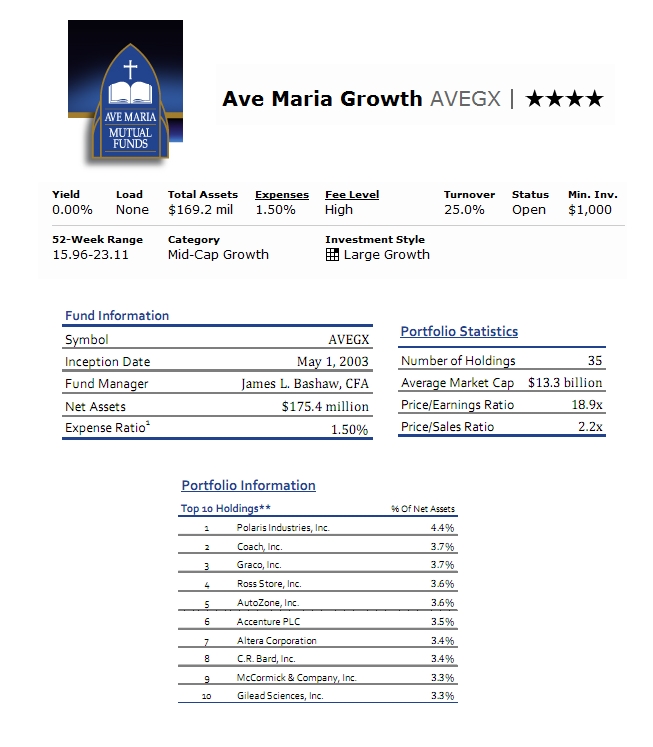 I have provided fund's review of this Ave Maria Growth Fund. It is considered as one of the best mid cap growth stock fund. You can use this fund to diversify your investment portfolio. The Ave Maria Growth Fund’s objective is to provide long-term capital appreciation. This Ave Maria fund invests mostly in common stocks of companies that offer above-average potential for growth in revenues, profits or cash flow. This Mid Cap Growth fund invests all of the equity investments and at least 80% of the net assets in companies meeting the fund’s religious criteria. This fund may invest in companies of all sizes or market capitalizations. This best fund also practices morally responsible investing. This process is designed to avoid investments in companies believed to offer products or services or engage in practices that are contrary to core values and teachings of the Roman Catholic Church. To capture the global economy opportunities, investor needs to buy international stock fund. Investing in this mutual fund can provide higher return and portfolio diversification. I have provided a fund review of BlackRock International Opportunities Investor A fund below. I also include various information like expense ratio, dividend yield, fund's performance, etc. This BlackRock International Opportunities Investor fund is to provide long-term capital appreciation. The fund generally invests majority of net assets (>80%) in equity securities issued by foreign companies of any market capitalization. This BlackRock mutual fund may invest <30% of net assets in stocks of issuers in emerging market countries. The fund primarily buys common stock but can also invest in preferred stock and convertible securities. From time to time it may invest in shares of companies through initial public offerings or IPOs. Small Cap stock fund can enhance your asset portfolio and provide diversification. 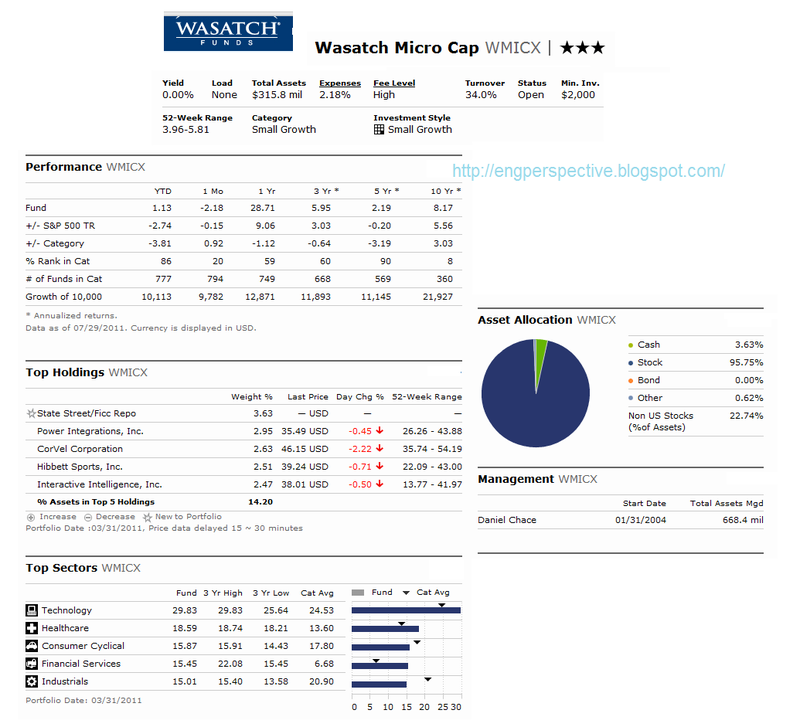 One of the best small cap fund is Wasatch Micro Cap fund (Ticker: WMICX). This fund is also featured in Forbes' best funds of 2011. Details about the fund review is described below. The Wasatch Micro Cap fund objective is to seek long-term growth of capital. It also has a secondary objective which is to provide income. This Wasatch fund invests at least 80% of net assets in the equity securities of micro-cap companies with market capitalizations of less than $1 billion. It may invest up to 30% of total assets at the time of purchase in securities issued by foreign companies in developed or emerging markets. As one of the small growth stock fund, this Wasatch fund’s manager is Daniel Chace since 2004. The fund has annual expense ratio of 2.18%. This fund has no 12b1 fee and no front-end sales load fee. Morningstar has rated this WMICX fund with 3-stars rating. This fund is currently on the 8th rank in the Small Growth category. Yield is another important part of investing in this market. During the bear market (i.e. down market), investor can count on the yield to withstand the volatile market. 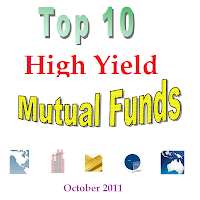 The following top 10 high yielding mutual funds include PIMCO International StocksPLUS TR Strategy A, Forward SMIDPlus Investor, U.S. Global Investors World Precious Minerals, etc. Dividend yield is great for investor who seeks regular income. This list may include either bond funds (fixed income funds) or stock funds (equity funds). The funds are sorted based on its dividend yield for the past 12 months. These mutual funds may include international stock fund, REIT stock fund, gold stock fund, equity income funds, and more. Note: The yield or dividend may change anytime, please check the fund’s prospectus for details. 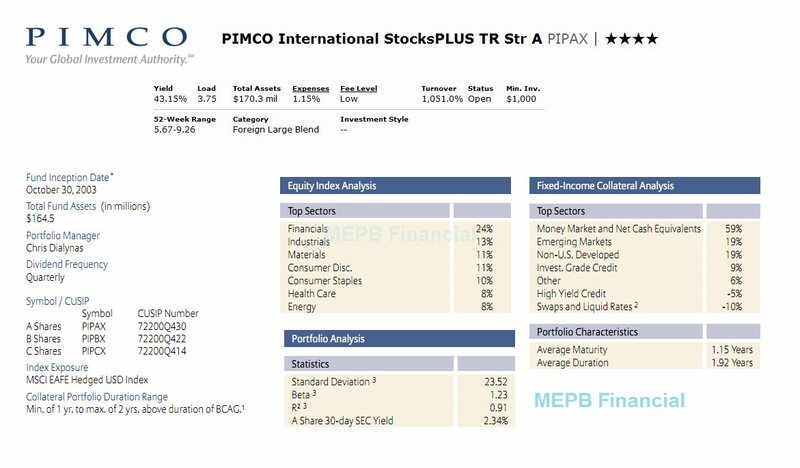 The PIMCO International StocksPLUS TR Strategy investment fund’s objective is to achieve total return which exceeds that of its benchmark index consistent with prudent investment management. This PIMCO fund usually invests majority of its assets in non-U.S. equity derivatives, backed by a portfolio of Fixed-Income Instruments. It generally limits its foreign currency exposure to 20% of total assets. The fund may invest <10% of total assets in high-yield securities. It may invest in common stocks, options, futures (including options), and swaps. The fund may also invest <10% of total assets in preferred stocks. It is non-diversified. This fund has been managed by Chris P. Dialynas since May 2008. This foreign large blend stock fund was introduced on October 2003. As the fund with the highest yield in this list, this PIMCO fund has 43.15% dividend yield that is distributed quarterly. The last dividend distributed in June 2011 is $0.30. This fund has 1.15% annual expense ratio, which is still lower than the average in the Foreign Large Blend category. To start investing in this fund, either in brokerage or IRA account, you will need $1,000 for the minimum initial investment with $50 minimum subsequent investment. As of September 13, 2011, this PIPAX fund has recorded 1.051% of annual holdings turnover. This is way higher compared to the average in the category which is 66.67%. 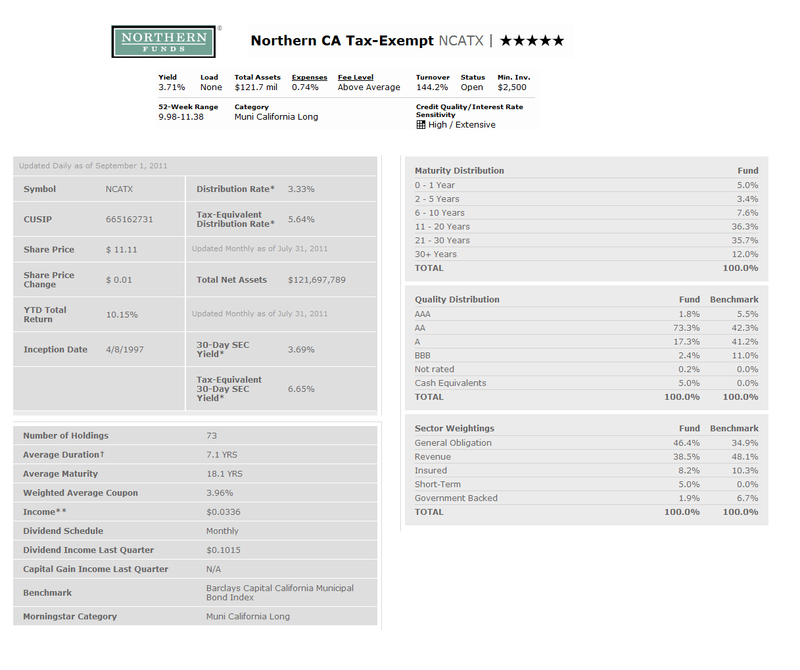 This fund charges 0.25% 12b1 fee and 3.75% front-end sales load fee. The total net assets of this fund are $170.28 million. This PIMCO fund is available for purchase from 85 brokerages. The other classes of this fund are Class B (PIPBX), Class C (PIPCX), Class D (PIPDX) and Institutional Class (PISIX). This fund has 1.15 years of average maturity with 1.92 years of average duration. Morningstar has rated this PIPAX fund with 4-stars rating. Since its inception, it has recorded 6 years of positive return and only 1 year of negative return so far. Based on the load adjusted return, this fund has returned 2.09% over the past three years. As of June 2011, the top sectors for equity index analysis are Financials (24%), Industrials (13%), Materials (11%), Consumer Discretionary (11%) and Consumer Staples (10%). The top sectors for fixed-income collateral analysis are Money Market and Net Cash Equivalents (59%), Emerging Markets (19%), Non-U.S. Developed (19%) and Investment Grade Credit (6%). 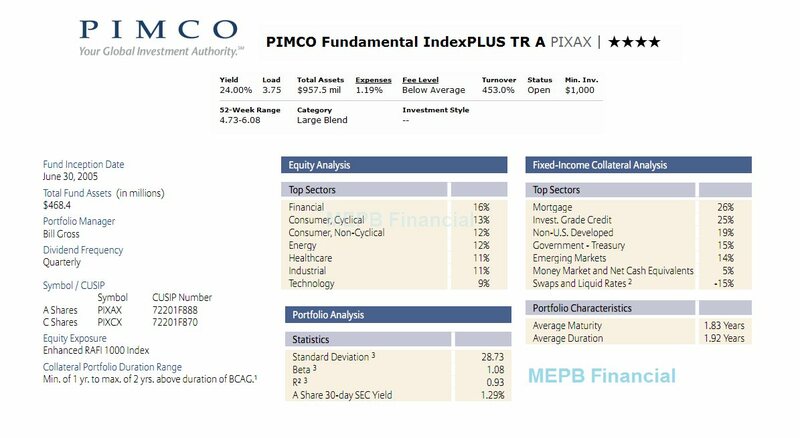 The PIMCO Fundamental IndexPLUS TR A fund seeks to provide total return which exceeds the performance of FTSE RAFI 1000 Index. The fund typically invests all of its assets in derivatives based on Enhanced RAFI 1000, an enhanced, performance recalibrated version of the index (“Enhanced RAFI 1000”), backed by a portfolio of short and intermediate maturity fixed-income instruments. It may invest in common stocks, options, futures, options on futures and swaps, including derivatives based on the index. The CUSIP of this PIXAX fund is 72201F888. Since its inception in June 2005, this PIMCO fund has been managed by William H. Gross. Bill Gross is the founder and co-CIO of PIMCO in the Newport Beach, CA. He is also a well-known bond guru. This PIMCO fund is in the category of Large Blend fund. The fund has a 1.19% annual expense ratio. It has 24.00% of dividend yield and has just distributed its last dividend in June 2011 ($0.18). The minimum initial investment for brokerage or IRA account is $1,000. There is 0.25% 12b1 fee and 3.75% front-end sales load fee. This fund has recorded 4 years of positive return with its best 1-year total return in 2009 with 56.50%. Morningstar has granted this PIXAX fund with 4-stars rating. This best rated domestic stock fund is available for purchase from 80 brokerages. Investor can choose from the other classes of this fund such as Class C (PIXCX), Admin Class (PXTAX), Class D (PIXDX), Class P (PIXPX) and Institutional Class (PXTIX). The CUSIP of PIXCX is 72201F870. 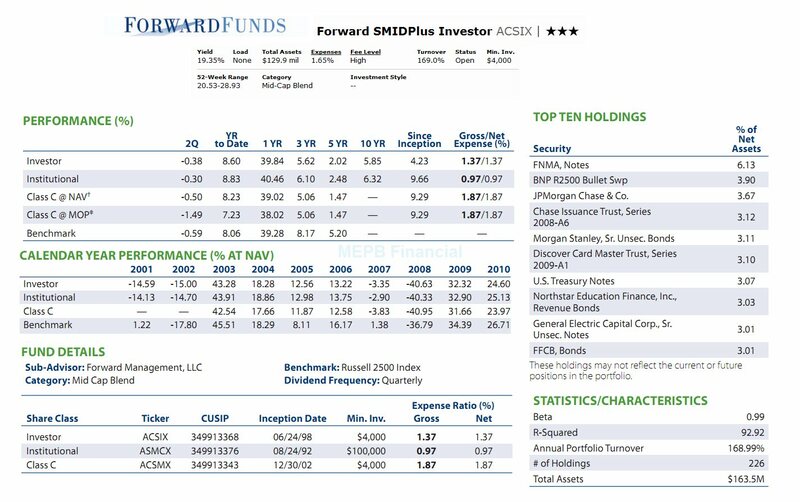 As of June 2011, the average maturity of this large blend US stock fund is 1.83 years and the average duration is 1.92 years. The top sectors of this PIMCO fund for equity analysis are Financial (16%), Consumer-Cyclical (13%), Consumer-Non-Cyclical (12%), Energy (12%), Healthcare (11%) and Industrial (11%). The top sectors for fixed-income collateral analysis are Mortgage (26%), Investment Grade Credit (25%), Non-U.S. Developed (19%), Government – Treasury (15%) and Emerging Markets (14%). 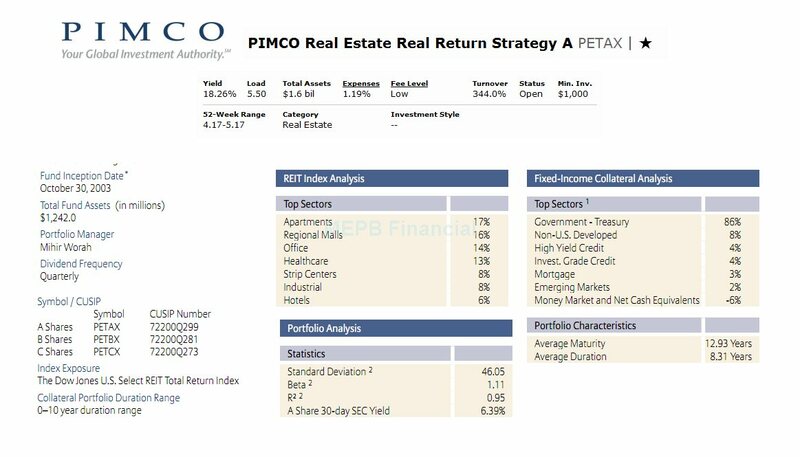 The PIMCO Real Estate Real Return Strategy A invests mostly in real estate-linked derivative instruments backed by a portfolio of inflation-indexed securities and other bonds. It may invest <30% of total assets in securities denominated in foreign currencies and may invest beyond this limit in U.S. dollar denominated securities of foreign issuers. The fund may also invest <10% of total assets in preferred stocks. This PETAX fund is classified as one of the Real Estate fund. 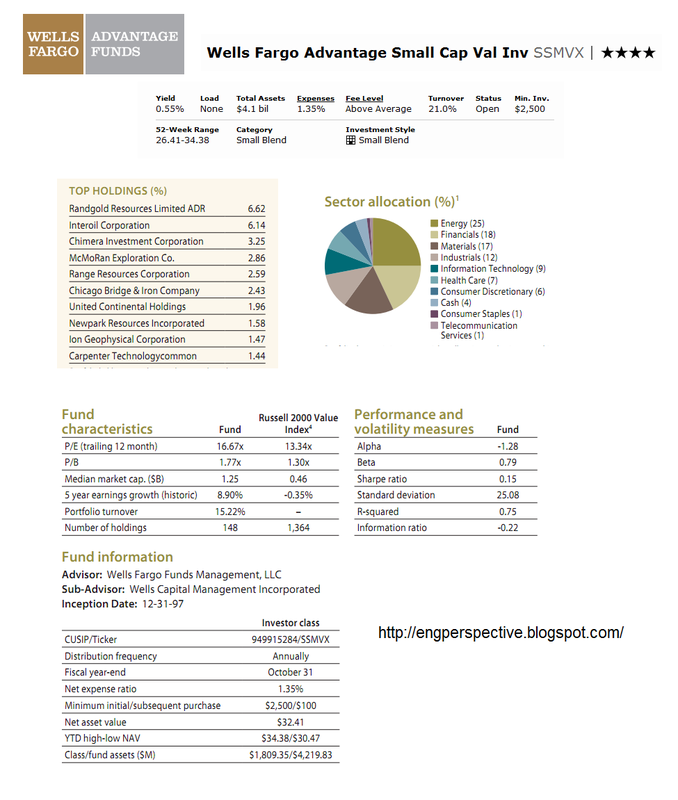 The annual expense ratio of the category is 1.45% and the expense ratio of this PIMCO fund is a bit lower (1.19%). The fund was introduced to public in October 2003. The fund’s manager since December 2007 is Mihir Worah. There is 0.25% 12b1 fee and 5.50% front-end sales load for investing in this fund. This fund has 19.19% dividend yield. The latest dividend was shared in June 2011 ($0.15). It has $1.5 billion total net assets. This fund has 17.10% YTD return. Since its inception it has recorded 5 years of positive return with the best in year 2009 (53.42%) and 2 years of negative return. Based on the load adjusted return, this fund has returned 24.84% over the past year, 6.08% over the past three years and 3.37% over the past five years. This fund has 4.55% 5-year average return. To buy this mutual fund, you will need a minimum initial investment of $1,000 for either brokerage or IRA account (tax deferred account). The minimum subsequent investment is $50. It can be purchase from a selection of 80 brokerages. The other classes of this PETAX fund are PETBX (Class B), PETCX (Class C), PETDX (Class D), PRRSX (Institutional Class) and PETPX (Class P). As of June 2011, the average maturity of this fund is 12.93 years and the average duration is 8.31 years. The top sectors for REIT Index Analysis are Apartments (17%), Regional Malls (16%), Office (14%) and Healthcare (13%). The top sectors for fixed-income collateral analysis are Government Treasury (86%), Non U.S. Developed (8%), High Yield Credit (4%) and Investment Grade Credit (4%). This Forward SMIDPlus Investor fund invests in synthetics or other instruments that have similar economic characteristics to common stocks of small and medium capitalization issuers, such as those in the Russell 2500 Index (the fund’s Benchmark). Small cap companies are companies with less than $1 billion market cap and mid cap companies are companies with $1 billion - $10 billion market capitalization. This fund is also known as Forward Extended Market Plus Fund. It has a dividend yield of 19.35% which is distributed quarterly. The latest dividend was distributed in June 2011 ($0.06). This fund was introduced to public in June 1998 and the current lead manager is Nathan J. Rowader. The annual expense ratio of this fund is 1.65%. This is a bit higher than the average in the Mid-Cap Blend category which is only 1.33%. The fund has total net assets of $129.88 million. To start investing in this mid cap blend stock fund, investor will need $4,000 to open a brokerage or IRA account (i.e. tax deferred account). Then investor needs to invest a minimum of $100 for the subsequent investment. The 12b1 fee of this fund is 0.25%. There is no front-end sales load fee. The other classes of this fund are Institutional Class (ASMCX) and C Class (ACSMX). The expense ratio of ASMCX is 0.97% and 1.87% for ACSMX. This fund is available for purchase from 49 brokerages. 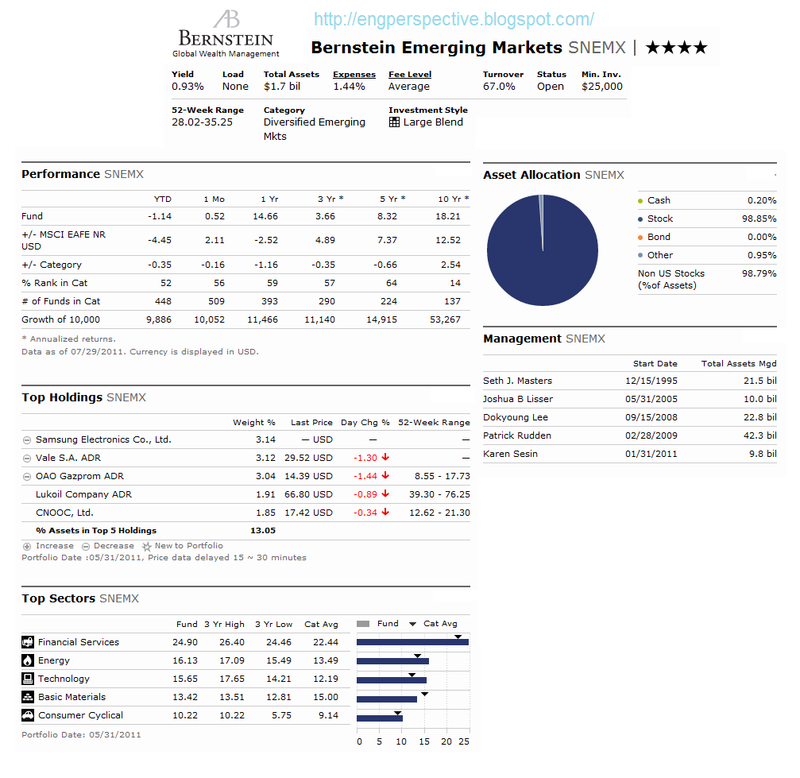 Morningstar gave this fund 3-star rating. The ratio of positive versus negative return performance since the inception is 7:5. The best 1-year total return was achieved in year 2003 with 43.48% while the worst return was in year 2008 with -40.63%. Based on the load adjusted return, this fund has returned 19.35% over the past year and 5.28% over the past decade. The fund uses Russell 2500 Index as the benchmark. As of June 2011, the top 10 holdings of this fund are FNMA, Notes (6.13%), BNP R2500 Bullet Swp (3.90%), JP Morgan Chase & Co (3.67), Chase Issuance Trust, Series 2008-A6 (3.12%), Morgan Stanley, Sr. Unsec. 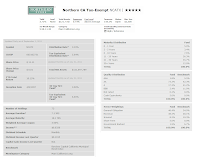 Bonds (3.11%), Discover Card Master Trust, Series 2009-A1 (3.10%), U.S. Treasury Notes (3.07%), Northstar Education Finance Inc, Revenue Bonds (3.03%), General Electric Capital Corp, Sr. Unsec. Bonds (3.01%) and FFCB, Bonds (3.01%). These are the top ten holdings out of 226 total holdings. 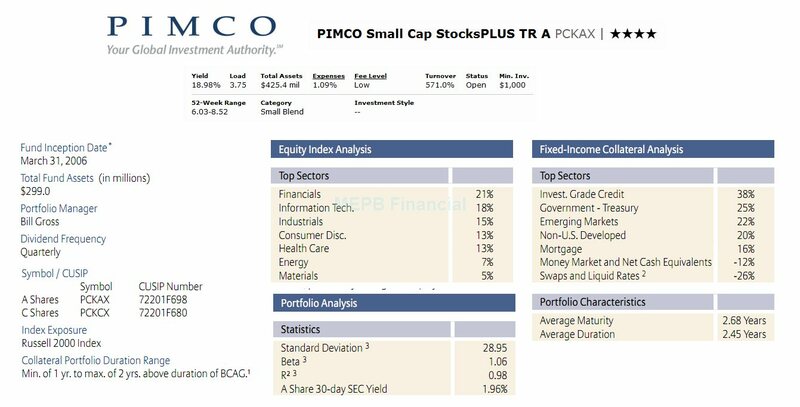 The PIMCO Small Cap StocksPLUS TR A fund’s objective is to provide total return which exceeds the Russell 2000 Index performance. 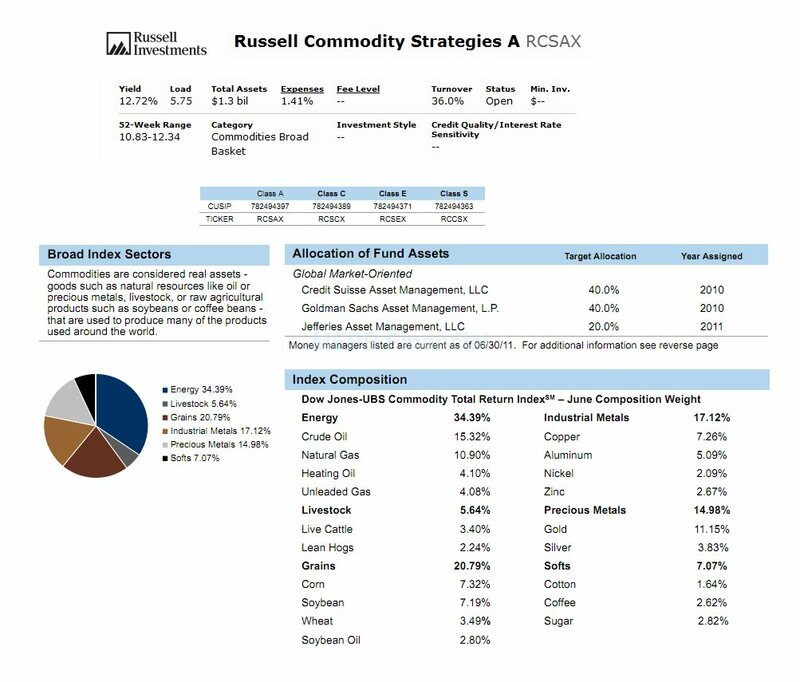 This PIMCO fund typically invests majority of its assets in Russell 2000 Index derivatives, backed by a diversified portfolio of Fixed-Income Instruments actively managed by PIMCO. It may invest in common stocks, options, futures, options on futures and swaps. The fund may invest up to 30% of total assets in securities denominated in foreign currencies and may invest beyond this limit in U.S. dollar denominated securities of foreign issuers. It may also invest up to 10% of total assets in preferred stocks. Bill Gross is the current fund’s manager of this PIMCO fund. This small blend fund was introduced to public on July 31, 2006. This fund has 1.09% expense ratio every year. This fee is a bit lower compared to the average in the Small Blend category (1.38%). This is a 0.25% 12b1 fee and 3.75% front-end sales load for investing in this fund. This fund has -15.48% YTD return. 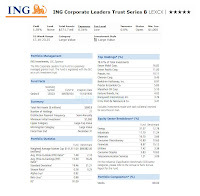 Morningstar gave this PCKAX fund 4-stars rating. The CUSIP of this fund is 72201F698. This fund is also available in other classes such as Class C (PCKCX), Class D (PCKDX), Institutional Class (PSCSX) and Class P (PCKPX). The benchmark of this fund is Russell 2000 Index. The average maturity of this PCKAX fund is 2.68 years and the average duration is 2.45 years. 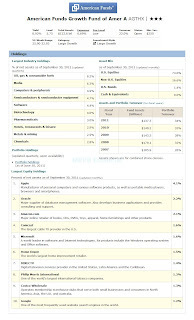 As of June 2011, the top 5 sectors for equity index analysis of this PIMCO fund are Financials (21%), Information Technology (18%), Industrials (15%), Consumer Discretionary (13%) and Health Care (13%). The top 5 sectors for fixed-income collateral analysis are Investment Grade Credit (38%), Government – Treasury (25%), Emerging Markets (22%), Non-U.S. Developed (20%) and Mortgage (16%). This U.S. Global Investors World Precious Minerals seeks long-term growth of capital plus protection against inflation and monetary instability. The fund invests >80% of net assets in companies equity principally engaged in the exploration for, or mining and processing of, precious minerals such as gold, silver, platinum group, palladium and diamonds. It participates in private placements, initial public offerings (IPOs), and long-term equity anticipation securities (LEAPS). The fund normally invests at least 40% of assets in securities of companies that are economically tied to at least three countries other than the U.S.This fund is classified as a non-diversified fund. 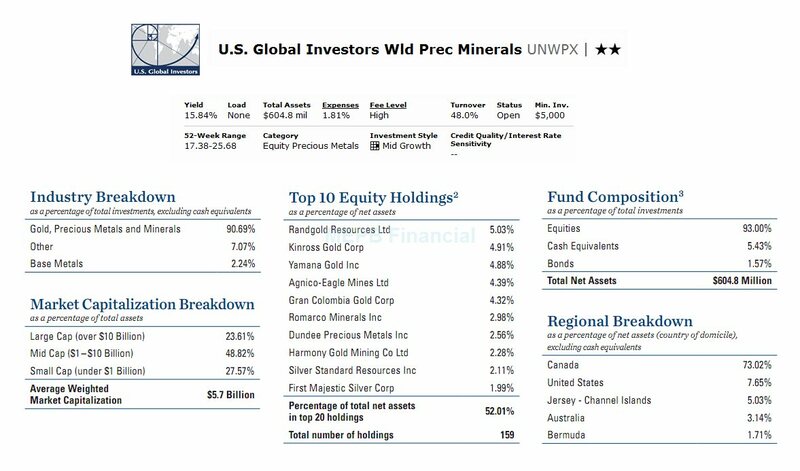 This UNWPX fund has been managed by Frank E. Holmes since June 1999 while the fund was introduced to public on November 29, 1985. The annual expense ratio of this equity precious metals fund is 1.81%. The average annual expense ratio in Equity Precious Metals is 1.40%. This fund has 0.25% 12b1 fee but there is no sales load. The total net assets of this fund are $604.81 million. This fund is available for purchase from 82 brokerages. The minimum initial investment is $5,000 for brokerage account with $100 minimum subsequent investment. There is no IRA account available. The dividend yield of this fund is 15.84%. The last dividend is distributed in December 2010 ($2.98). This UNWPX fund has 2-stars rating from Morningstar. The fund has a total of 15 years of positive return during its 25-year tenure in the market. Based on the load adjusted return, this fund has returned 12.71% over the past year and 26.27% over the past ten years. As of August 2011, this fund has a total of 159 holdings. The top 20 holdings represent 52.01% of the total net assets. The top ten equity holdings of this fund are Randgold Resources Ltd (5.03%), Kinross Gold Corp (4.91%), Yamana Gold Inc (4.88%), Agnico-Eagle Mines Ltd (4.39%), Gran Colombia Gold Corp (4.32%), Romarco Minerals Inc (2.98%), Dundee Precious Metals Inc (2.56%), Harmony Gold Mining Co Ltd (2.28%), Silver Standard Resources Inc (2.11%) and First Majestic Silver Corp (1.99%). 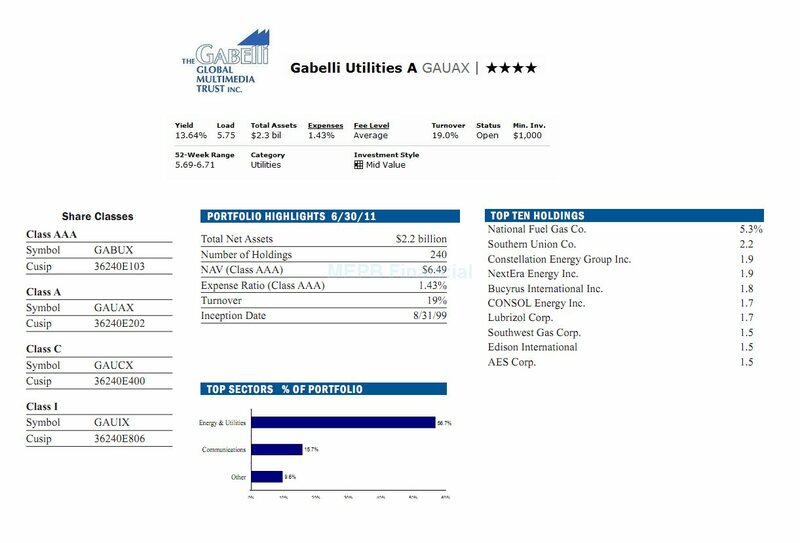 The Gabelli Utilities fund invests most of its net assets (>80%) in securities of domestic or foreign companies (i) that are involved to a substantial extent in providing products, services or equipment for the generation or distribution of electricity, gas, and water and the provision of infrastructure operations or telecommunications services, and (ii) that the adviser believes have the potential to achieve either capital appreciation or current income. It may invest <40% of its total assets in foreign companies stocks. This Gabelli fund currently has expense ratio of 1.43% per year. The average expense ratio in the Utilities category is 1.39%. Mario J. Gabelli has been with this fund since August 1999, though this fund was then introduced to public in December 2002. This GAUAX fund has total net assets of $2.2 billion. It has a distribution rate of 13.64%. The last dividend was paid in August 2011 ($0.07). The minimum initial investment for brokerage account is $1,000 and $250 for IRA account. There is a 12b1 fee of 0.25% and a front-end sales load fee of 5.75%. This GAUAX fund has 4-stars rating from Morningstar as it has recorded 7 years of positive return since its inception 8 years ago. Based on the load adjusted return, this fund has returned 9.51% over the past year and 6.19% over the past ten years. This fund uses S&P 500 Utility Index as its benchmark. The other shares classes of this fund are Class AAA (GABUX), Class C (GAUCX) and Class I (GAUIX). The fund can be purchased from 58 brokerages. As of June 2011, this fund has a total of 240 holdings. The top ten holdings are National Fuel Gas Co. (5.3%), Southern Union Co. (2.2%), Constellation Energy Group Inc. (1.9%), NextEra Energy Inc. (1.9%), Bucyrus International Inc. (1.8%), CONSOL Energy Inc. (1.7%), Lubrizol Corp. (1.7%), Southwest Gas Corp. (1.5%), Edison International (1.5%) and AES Corp. (1.5%). 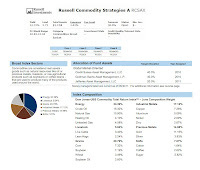 The Russell Commodity Strategies investment fund invests in corporate stocks, U.S. government securities, mortgage-backed securities, asset-backed securities, and municipal debt obligations. The fund also invests <10% of assets in debt securities that are rated below investment grade. It may invest <35% of assets in foreign securities including emerging markets. This Russell fund will hedge its exposure to foreign currency through the use of currency futures and options on futures, forward currency contracts and currency options. It is non-diversified. James Ind has managed this fund since its inception in July 2010. This fund has total net assets of $1.34 billion. 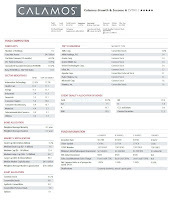 The dividend yield of this RCSAX fund is 12.72%. The first and latest dividend is distributed in December 2010 ($1.48). The annual expense ratio of this fund is 1.41% while the average expense ratio in Commodities Broad Basket is 1.32%. The 12b1 fee of this fund is 0.25% and 5.75% front-end sales load fee. Since this fund is new, there is no rank from Morningstar yet. The fund has returned 16.68% over the past year. The YTD return of this fund is -3.11%. This fund is currently available at a shortlist of 11 brokerages only. The other classes of this fund are Class C (RCSCX), Class E (RCSEX), Class S (RCCSX) and Class Y (RCSYX). The PIMCO Fundamental Advantage Total Return fund objective is to provide maximum total return, consistent with prudent investment management. This PIMCO fund generally invests in derivatives providing long exposure to Enhanced RAFI 1000 and short exposure to the S&P 500 index, backed by a diversified portfolio of short and intermediate maturity Fixed-Income Instruments. It may invest in common stocks, options, futures, options on futures and swaps to gain long exposure to Enhanced RAFI 1000 and short exposure to the S&P 500. The fund may invest in exchange traded funds. It may also invest <10% of total assets in preferred stocks. This PIMCO fund is one of the highest yielding funds in the Intermediate-Term Bond category. This is another Bill Gross managed PIMCO fund. Bill has managed this fund since February 2008 yet this fund was introduced to public in July 2008. This fund has a dividend yield of 12.62% which is distributed quarterly. The last dividend distributed for second quarter of 2011 is $0.05. The annual expense ratio of this fund is 1.29%. Based on the load adjusted return, this bond fund has returned -4.22% over the past year and 7.31% over the past three years. Even though this fund is still new, but it has 3-stars return rating from Morningstar already. This fund is available in other classes like Class C (PTRCX), Class D (PFSDX), Class Institutional (PFATX) and Class P (PFAPX). The average maturity of this PIMCO fund is 1.28 years with 2.64 years of average duration. 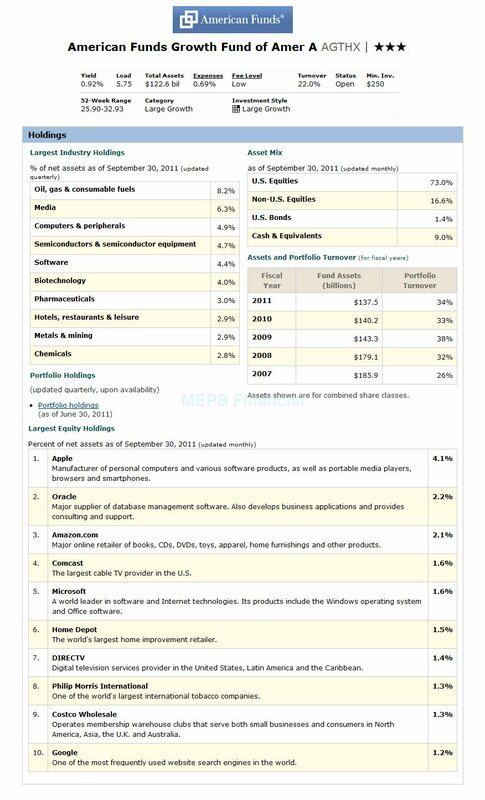 As of June 2011, the top 5 sectors of this fund are Money Market and Net Cash Equivalents (49%), Non-U.S. Developed (17%), Emerging Markets (14%), Invest. Grade Credit (11%), Mortgage (9%), Government - Treasury (8%) and High Yield Credit (4%). 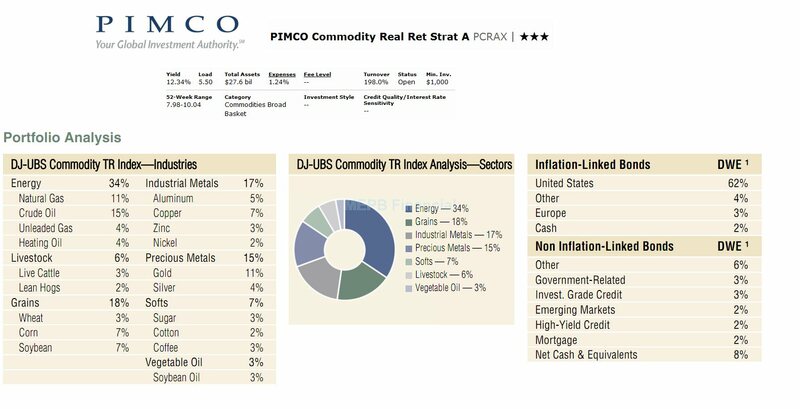 The PIMCO Commodity Real Return Strategy fund typically invests in commodity-linked derivative instruments backed by a portfolio of inflation-indexed securities and other fixed-income instruments. It seeks to gain exposure to the commodity markets primarily through investments in leveraged or unleveraged commodity index-linked notes. It also can invest in preferred stocks. Mihir Worah has managed this PIMCO fund since December 2007. The PCRAX fund has been in the market since November 2002. This fund has a dividend yield of 12.34%. The last dividend was distributed in June 2011 ($0.46). This fund has 1.24% annual expense ratio which is a bit lower compared to the average in the Commodities Broad Basket category (1.32%). To buy this commodity mutual fund in the brokerage account, you will need a minimum of $1,000 for the initial investment. Same amount applies for IRA account. This fund has total net assets of $27.61 billion. There is 0.25% 12b1 fee and 5.50% front-end sales load fee. Morningstar gave this fund a 3-stars rating. As of June 2011, the top 5 sectors of this fund based of DJ-UBS Commodity TR Index Analysis are Energy (34%), Grains (18%), Industrial Metals (17%), Precious Metals (15%), Softs (7%), Livestock (6%) and Vegetable Oil (3%). Note: Another alternative to invest in this PIMCO Commodity Real Return Strategy A fund is to invest in Harbor Commodity Real Return Strategy (Ticker: HACMX). Some researchers have shown that dividends provide the majority of stock market returns over the long haul. Scottrade – Scottrade offers variety of mutual funds. There are 3,000 No load & No Transaction Fees (NTF) fund for free. You can also trade 15,000 mutual funds for $7.00 per trade. Merrill Edge – This new Merrill Edge product is offered by Bank of America (BofA). It also offers about 3000+ mutual funds. If you meet the requirement, you can also get 30 free trades for trading stocks or ETFs (Exchange Traded Funds). Firstrade – Firstrade offers 11,000 mutual funds to invest. You can use the mutual funds screener to select your fund. It is free to invest in No Transaction Fee mutual funds and load funds, but it charges $9.99 for no loads funds. 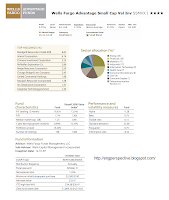 Please check my Best Online Brokerages 2012 page for additional online mutual fund brokers or stock brokerages. The following is the list of Today's Top Performer CEFs. The list include: PIMCO Global StocksPLUS & Income, Gabelli Natural Resources, Gold & Income, Nuveen Global Value Opportunities, and more. The fund's performance is sorted based on its market price. If you are interested in NAV, please check cefa or cefconnect website. Bruce fund (BRUFX) is among the top performer and best rated moderate allocation balanced fund. It invests in bonds and stocks. You may find the fund review below. 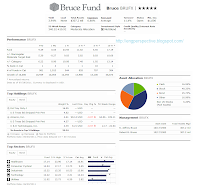 The Bruce fund objective is to achieve long-term capital appreciation. The fund invests primarily in domestic common stocks and bonds, including convertible bonds and zero coupon treasury government bonds. This Bruce fund invests in domestic common stocks of any capitalization where the overriding strategy is long-term capital appreciation. It may also invest in foreign securities. Rated forth in the best funds of Forbes list, this Bruce fund has been managed by Robert B. Bruce since its inception in October 1983. He has been president of Bruce & Company since 1974. This moderate allocation balanced fund is categorized in Moderate Allocation category. The fund has no management fee and no front-end sales load fee. The minimum balance needed to open a brokerage account in this fund is $1,000 with $500 minimum subsequent investment. For retirement (IRA) account or tax deferred account, please check with your account administrator. According to the fund’s website, this fund is currently not available for sale in Nebraska or Texas. For 2011 year-to-date, this BRUFX fund has returned 9.49%. This 5 stars rated fund has returned 23.93% over the past year, and 17.19% over the past decade. There is no other class available for this best rated fund. The top holdings of this balanced mutual fund as of June 2011 represent 35.34% of the total portfolio. The assets allocation of BRUFX fund is 40.33% in Stock, 25.73% in Bond, 16.95% in Cash and 16.99% in Other. The top sectors of Bruce Fund are Healthcare (17.14%), Consumer Cyclical (14.94%), Industrials (13.32%), Technology (12.22%) and Utilities (11.92%). If you are interested in balanced fund, please check my previous articles. Exchange Traded Funds are another popular investment fund vehicle. The following is the top performing ETFs for the past third quarter. The top performer funds include iShares Barclays 20+ Year Treasury Bond, PIMCO 25+ Yr Zero Coupon U.S. Treasury Index ETF, Vanguard Extended Duration Treasuries Index ETF. The funds are sorted based on its past quarter performance. I also included some details about the fund on the next table. More review can be found below. None of these funds is part of leverage ETF. As part of Forbes best fund, CGM Focus has outperformed many funds over the long term period. While it has been lagging its peers for the past 3 years, it is still one of the choice by investor to diversify his/her portfolio. The following is details CGM Focus fund review. The CGM Focus fund is seeking long-term growth of capital. This fund normally invests in the stock of between 20-100 companies at any one time. It may invest in companies of any size, but primarily invests in companies with market capitalizations of more than $5 billion. The fund may also invest in debt and fixed income securities (investment grade & non-investment grade or junk bonds). G. Kenneth Heebner is the fund's manager since September 1997. This CGM fund has $2.58 billion net assets. The annual expense ratio is 1.03%. Morningstar has rated this fund with 2-stars rating. It has 1.29% beta for over the last three years. The annual holdings turnover of this rate is quite high (363.0%) compared to the average in Large Growth category which is 87.49%. This CGMFX is a no load fund, there is no 12b1 fee and no sales load fee as well. 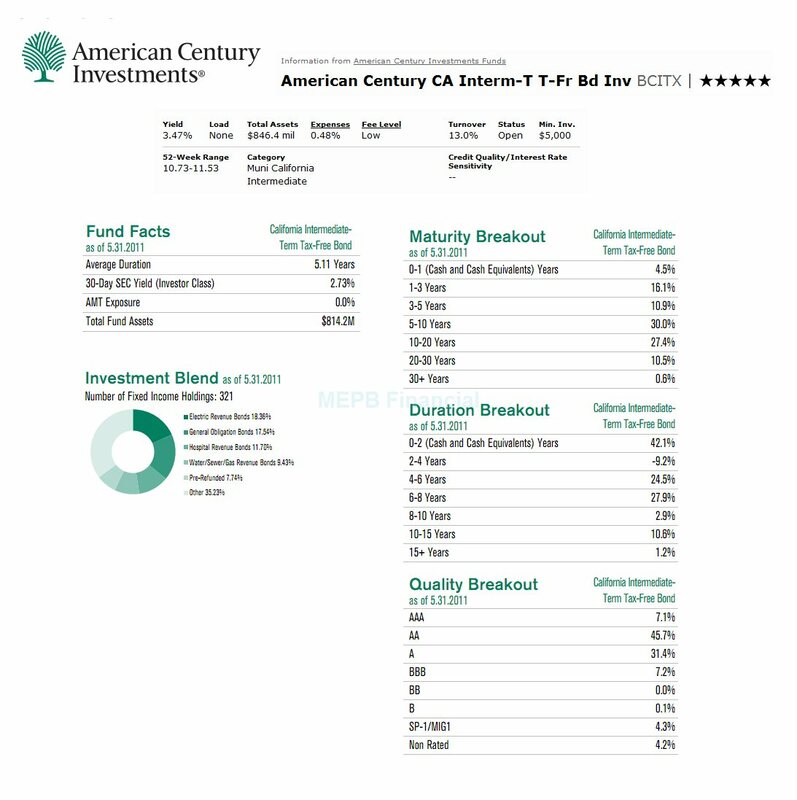 The American Century California Intermediate-Term Tax-Free Bond fund’s objective is to achieve safety of principal and high current income that is exempt from federal and California income taxes. The fund invests >80% of assets in investment-grade debt securities with interest payments exempt from federal and California income taxes. This Municipal bond fund may also invest <20% of assets in below investment-grade securities. The fund’s weighted average maturity is about three years to ten years. However, there is no maturity limit on individual securities. Another alternative investment strategy is investing in small /mid cap international stock fund. As we know, international stock funds don’t have a straight correlation to domestic stock funds. These international stock funds also have outperformed some of the domestic stock funds. These funds can also be useful for portfolio diversification. 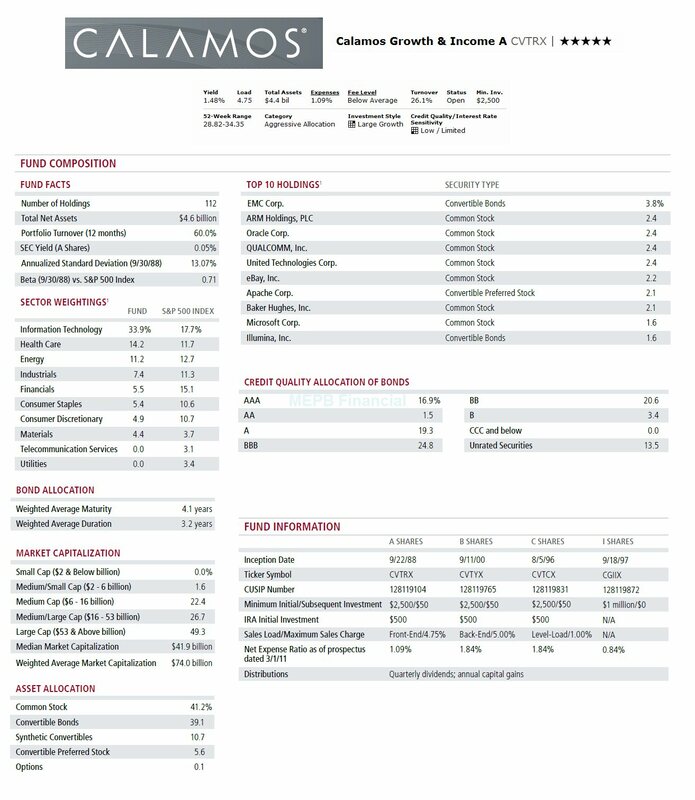 One of the best rated international stock funds is listed below. More of top fund review can be found in my MEPB Financial website. The Royce International Smaller-Companies fund’s objective is to seek long-term growth of capital. The fund invests >80% of assets in the equity securities of companies with market capitalizations up to $5 billion at the time of investment. The fund also typically invests majority of assets (>65%) in the equity securities of international companies domiciled in >3 different countries. The fund invests <35% of assets in the securities of companies domiciled in developing countries. Generally, developing countries include every country in the world other than the United States, Japan, Western European countries, Canada, Australia, New Zealand, Hong Kong, Singapore, South Korea, Taiwan, etc.